There are 107 public use airports in Georgia. The main airport of Georgia is Hartsfield-Jackson Atlanta International Airport (ATL). Other major airports in the state are the DeKalb-Peachtree Airport in Chamblee and Savannah/Hilton Head International Airport. There are 107 public use airports in Georgia. The Georgia airports are supported by the state in their functioning. The principal airport of Georgia is Hartsfield-Jackson Atlanta International Airport (ATL). It is the busiest passenger airport in the world. 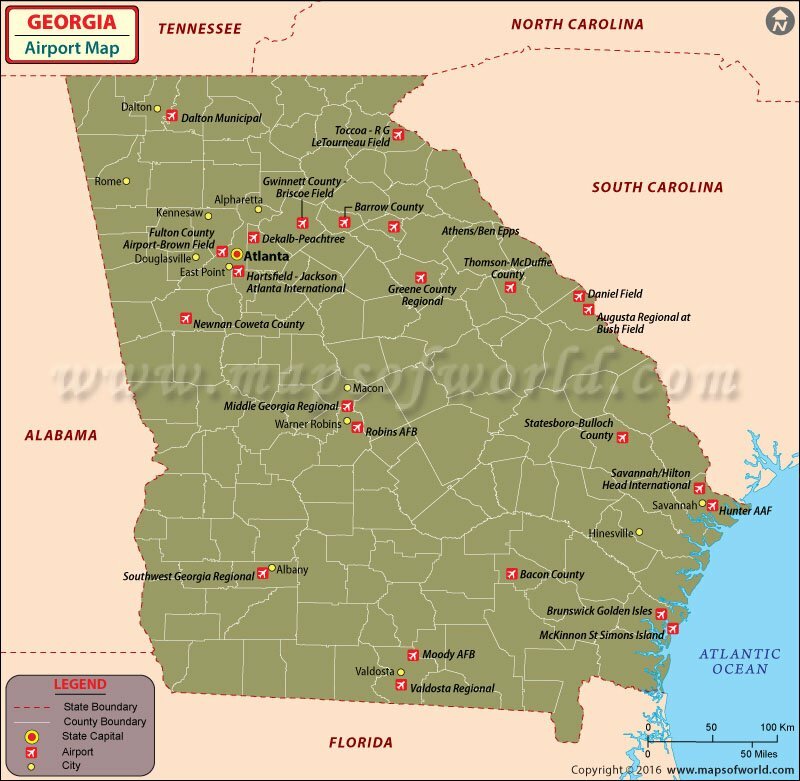 Out of the 107 public-use airports in Georgia, 98 are general aviation airports and nine are commercial-aviation airports. Two other significant airports of the state are the DeKalb-Peachtree Airport in Chamblee, and Savannah/Hilton Head International Airport, which offers services to more than 1,700,000 passengers annually. Many of the airports in Georgia have been converted from air and military bases into public use airports and as a result, have a connection to the national history of USA too. The Peach state of Georgia receives many visitors every year. Airports in Georgia make an important contribution to the economic growth of the state and provide employment to many thousands of people. There are two important international airports in the state, which are the Hartsfield-Jackson Atlanta International Airport and the Savannah/Hilton Head International Airport. Locally known as the Atlanta Airport, Hartsfield, the Hartsfield-Jackson Atlanta International Airport has almost 80 airlines operating from its premises and is the busiest airport of the state. It is the major hub of Delta Airlines, AirTran Airways, and Atlantic Southeast Airlines (a Delta Connection partner). The airport operates international flights to South America, North America, Central America, Asia, Europe, and Africa. It has 207 domestic and international gates. The Hartsfield-Jackson Atlanta International Airport is the primary hub of Delta Air Lines, Delta Connection and Delta Air Lines partner, ExpressJet. One of the best things about this airport is that it serves as the focus city for several low-cost carriers including Southwest Airlines, Frontier Airlines and Spirit Airlines. The Savannah/Hilton International Airport has 1,700,000 passengers go through its gates annually. Airlines operating from this airport are Delta (together with Delta Connection carriers Comair and ASA), United Express, Continental Airlines, American Eagle and US Airways. Both the airports have world-class facilities and use the most modern technology and innovations in flying. Also, both the airports are disabled-friendly and are prominently located near business centers to make traveling easy for tourists and businessmen. The major airlines that operate from the airports in Georgia include American Airlines, Delta, AirTran, US Airways, United Airlines, Continental Express, British Airways and Canadian to name a few. The tickets of these airlines can be purchased online from their respective sites.